The Central Kentucky chapter is one of the oldest chapters within KFTC. We are a diverse group of people who care about making our communities healthy and safe for all people. Our chapter members are interested in a range of issues, but currently we are working on educating folks about democracy through our voter empowerment work. We're also focusing on building economic, environmental and racial justice in Lexington and the Central Kentucky area. Please join us at our next chapter meeting or at one of our upcoming events. Meet other chapter members to learn about the exciting work we're doing and how you can be a part of it! 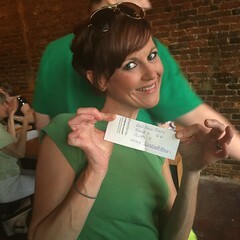 The Central Kentucky Chapter of KFTC hosted their first installment of #KentuckyTrivia on Wednesday, June 29 at the West Sixth Brewery Green Room in Lexington. In partnership with Kentucky For Kentucky and West Sixth Brewery, KFTC members organized and created a fun space to learn and celebrate the best of these United States. Trivia hosts and KFTC members Chuck Clenney (also with Lexington Community Radio) and Meredith Wadlington kept the event lively and fun. "This event was Kentucky edutainment at it's finest! It was so much fun hosting and we all learned a lot and, even though there was only 1 winning team, I think we all won in the end,” Clenney said. KFTC members learned about being an “active bystander” at a May 31 training the Central Kentucky KFTC Chapter sponsored with Green Dot Lexington. “During the course of the evening, KFTC members enhanced their understanding of different intervention techniques that diffuse tension in potentially high-risk situations, and expanded their awareness on everyday ways they can advocate for community safety,” said Green Dot facilitator Meredith Swim. Green Dot teaches that there are three ways to intervene in a violent situation – the Three Ds. The Three Ds are: direct, delegate and distract. Direct is directly engaging with the situation, but many of us might struggle to do that so we can also delegate to friends and family of the victim or the police. Or, we can create a distraction and de-escalate the situation. I recently participated in a “response to the call to action” at the University of Kentucky. Central Kentucky KFTC Chapter members are still celebrating a big victory in Lexington. 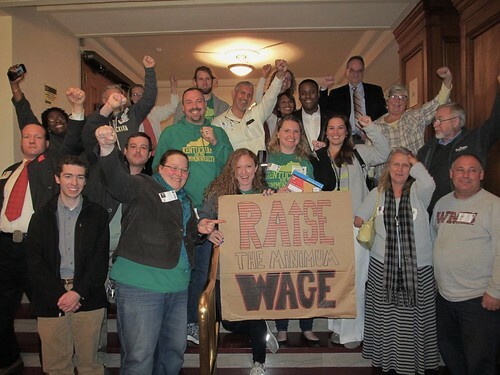 On November 19 the Lexington Fayette Urban County Government voted 9-6 to raise the minimum wage in Fayette County from $7.25 to $10.10 over a period of three years. The chapter had been working on this issue for nearly a year by lobbying council members, cosponsoring and attending rallies, speaking at council meetings, writing and calling council members, and writing op-eds and letters to the editor, among other strategies. This victory is significant not only because it will affect an estimated 31,300 workers, according to the Kentucky Center for Economic Policy, but also because it makes Lexington the second city in Kentucky and only the third city in the South to raise the minimum wage. Janet Tucker, a long-time KFTC member, former KFTC chair, and co-chair of the Working Families Campaign is excited about the victory. She first brought the issue of raising the minimum wage to the chapter. We meet every 3rd Thursday of the month at 7 PM at the Episcopal Mission House at the corner of 4th St. and Martin Luther King Jr. Blvd (across the street from the Living Arts & Science Center) in Lexington. Join us for our monthly chapter meeting.